If you and your pup are looking to hit the trails anytime soon, you are likely in need of a dog hiking harness. I avoided getting one for the longest time, thinking a simple leash and collar were good enough. And the truth is they were, until I started doing longer hikes and steeper hikes. At that point a harness became absolutely necessary to keep my furry friend safe. I’ve since been hiking with my dogs for over 10 years and the Ruffwear Web Master is the best harness currently available. This Ruffwear Web Master dog hiking harness has the honor of being the preferred choice for avalanche rescue dog teams in the U.S.
It’s five available sizes and five points of adjustment are perfect for custom-fitting to your dog’s form. 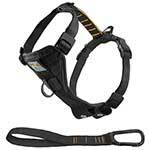 This is also the harness I personally use on most of our hikes. The video below is me and my Carolina Dog (named Story). Around the 27 second mark you can see how this harness handle allows me to secure her on steeper sections of the hike/climb, and in some cases even lift her up. The Web Master features a foam-padded chest and adjustable belly straps on the bottom side, and two leash attachment rings. The trim is reflective, which adds visibility in low-light situations. With load-balanced dispersion, you can be sure your pup feels comfy on the trails in this harness. It also has a built-in handle on the top (one of my favorite features) to assist in handling and maneuvering dogs through obstacles you may come across on the trails. Pros: Top rated harness, custom-fitting and multiple sizing options available. Cons: If kept loose it has a tendency to “twist” slightly depending on which side the leash is on. With five adjustment points and five sizes, the Kurgo Tru-Fit Smart Dog Walking Harness is a durable and comfortable choice for active dogs ready for their next adventure. The plastic quick-release buckles allow for easy removal and putting on – crucial in any activity harness! The Tru-Fit also comes with a 10-inch lead with a loop that can be paired with your car seat belt for maximum safety on the ride to and from your adventurous destination. 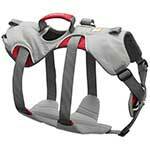 The chest plate is specially designed to be no-pull, swiveling when your pup attempts to tug you around. This design will also reduce pressure on your dog’s neck and shoulders, keeping them from accidentally choking themselves. Pros: Quick on-and-off, no-pull design harness. Cons: While great for hiking, this may not be the best option for climbing or water activities. Perfect For: Long walks and hitting the trails – pups of all sizes can fit in this one! Note: You can click on the harness in the table below for more information. Fit. To know what size harness your dog needs you’ll have to measure their girth. Girth is the measurement around the widest part of your dog’s rib cage. Use a soft tape measure especially before ordering online to make sure you get the size exactly right. This is the Ruffwear size chart, and just an example of wear to measure girth. Each harness will have their own sizing chart. 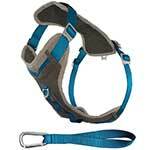 Sizing plays a huge role in keeping your dog secure in the harness of your choosing. Too small can restrict their breathing, especially during rigorous outdoor activity. On the other side of the spectrum, a harness that is too big will put your pup in danger of slipping out of it and running off or hurting themselves. Function. The harness you choose for outdoor adventures should be made to withstand the type of activity you have planned. For example, if you’re planning on a weekend trip with multiple trail hikes, the harness should be comfortable enough for long-term wear. 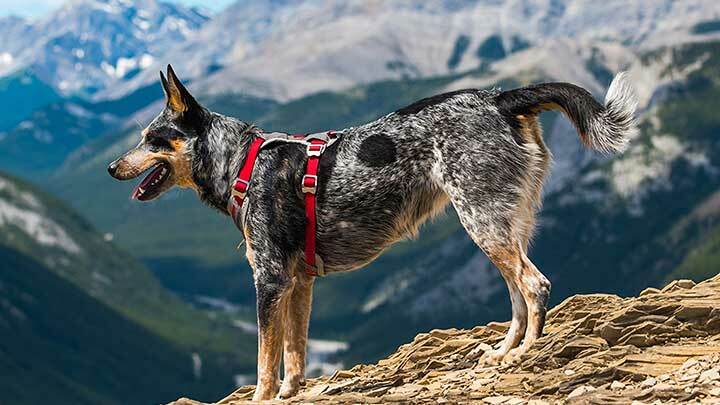 If you know in advance that the trail you’re attempting may be particularly difficult for your pup to navigate, you can purchase a harness with an agility handle to help them over the rough patches. Mobility. A hiking harness or pack should be as lightweight as possible and allow your dog to easily navigate the adventures you have planned together. Fabric should be considered depending on the climate in which you plan your hikes. If the weather is hot and humid, you want to be sure to choose a breathable fabric that doesn’t overheat your dog. If cold weather is anticipated, you may want to layer a harness with a dog activity vest or coat. Any hiking harness with added storage pockets should have the weight dispersed properly to keep from dragging your dog down. The goal is to keep them happy, while keeping them safe! The major differences between an everyday walking harness and a hiking harness can be the durability and the overall design. Hiking harness materials tend to be stronger and made to withstand heavier wear-and-tear over time. The clips and leash attachment points should be heavy-duty and rust-resistant, and be made to easily swivel or work with a lead to keep you and your dog from getting tangled on long hikes. Hiking harnesses also have extra design aspects such as padded handles for assisting them over rough terrain, or reflective lining to help with visibility. We talked about the Ruffwear Web Master and Kurgo Tru-fit above, now let’s take a deeper dive into the rest of the competition. The EXPAWLORER Best Front Range No-Pull Dog Harness is amazing for dogs that are ready for their next adventure! Made with scratch-resistant, durable outer material and a lightweight padded mesh lining, this harness design is ergonomic and boasts that it is easy to put on and off your pet. Being a front range harness, the design is made to relieve pressure from your dog’s neck, which can cause injury even if they aren’t like to pull. The available colors are bright and reflective for maximum visibility in poor lighting conditions. Two points for leash attachment give you the flexibility to use this harness as you and your pup need to, and adventure freely and safely on your way. Cons: This harness does not have leg loops like some models. 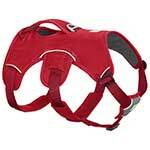 Perfect For: The brand states that this harness is most effective on small to medium sized dogs. Details: This adjustable Outward Hound DayPak – Adjustable Saddlebag features expandable pockets for storing hydration and snacks on your next adventure. 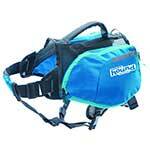 It’s lightweight capacity offers the security of a harness and the convenience of a small backpack all in one. Available in two bright, reflective colors and three different sizes, this day-pak is excellent for your next outdoor adventure or just everyday errands. Pros: Expandable pockets, storage, reflective coloring. Cons: Saddlebag design may take some getting used to at first. Perfect For: Trail blazing pups that don’t mind carrying a lightweight pack. The Kurgo Journey Dog Harness is fantastic for normal weekday walks or more treacherous trails with your hiking buddy. 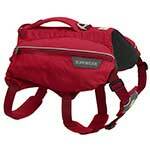 It features a back handle and padded chest piece for comfortably navigating your pup whenever the next adventure lies. Four adjustment points and four available size options help to custom-fit the harness to your dog. The D-ring attachment allows this harness to be used as a no-pull harness. Made of strong, breathable ripstop fabric with a cross-hatched weave, this harness is machine washable. It also comes with a 10-inch lead line for training purposes that can also act as a doggy seatbelt. Pros: Durability, great for hiking and climbing. Comfortable for everyday wear, too! Perfect For: Hiking and climbing pooches 5-110 lbs! 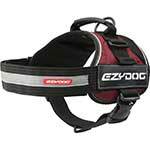 With seven available sizes, the EzyDog Convert Trail-Ready Dog Harness can fit any active dog. A tear-resistant polyester outer layer prevents wear and tear while the soft cotton interior is comfy against your pup’s coat. Perfect for trails, biking, or city walks, this harness is made with breathable materials to keep your dog safe and cool. A quick-release plastic side buckle makes this model easy to put on and remove. Designed to be utilitarian, and yet stylish, this harness combines simplicity with durability to keep your dog secure in any environment. Pros: Simple design, many sizes. Another Ruffwear favorite is their Doubleback Harness. This harness is uniquely designed to be used not only as a hiking harness, but as a climbing harness too! This model has been strength-tested to allow your pup to be belayed to previously inaccessible heights with the use of proper climbing gear. The padded support around the stomach and support leg loops help to disperse weight evenly and stabilize your pup. Foldable leg loops make for a total of seven adjustment points on this harness, and the anodized aluminum Doubleback buckles are designed for ultimate safety. Comes in four available sizes to custom-fit your climbing pup! Cons: Only one color option. Perfect For: All size pups that aren’t afraid of heights! 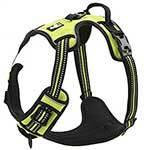 This unique Ruff Wear SingleTrak Mobile Hydration dog harness is also a hydration station all on it’s own! If you and your best furry friend are hitting the trails for just a day trip, this harness is perfect for eliminating unnecessary hiking packs. With two included collapsible water bottles that hold just over half a liter each. You and your pup will have all the water you need to sight-see and hike the day away. The padded assistance handle let you help your dog over difficult obstacles along the trails while foam-padded chest make for comfortable, all-day wear. Pros: Added storage for hydration packs. Cons: The weight of the water may slow your pup down a bit, but not much. What about tactical dog harnesses? 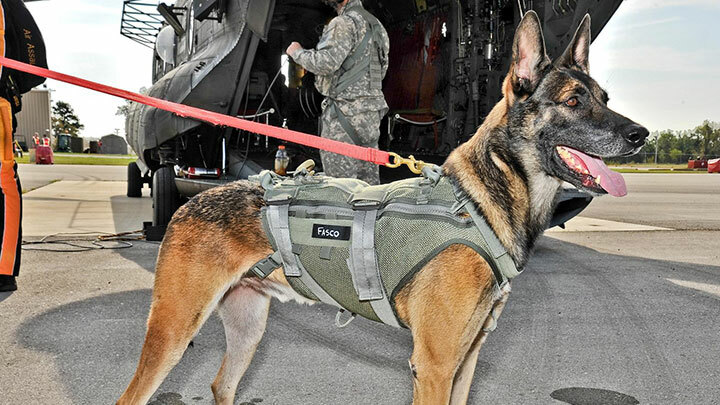 You may have noticed we didn’t include any tactical dog harnesses. That’s because we created an entirely separate article devoted to the best tactical harnesses for dogs. Go check it out here if that’s more the style you’re interested in.